When the city halted construction on a Hunters Point library this past spring, pop-up and mobile libraries provided alternative services. 1 Queens Library CEO Thomas Galante, who is currently on paid leave due to an investigation into his salary and spending, had said plans were halted because of budget discrepancies concerning the complexity of the building’s designs. 2 Hunters Point residents petitioned for access to a public library, leading Queens Library to open a mobile library at the would-be site of construction. In addition, a group called Friends of Hunters Point Library has kicked off their own pop-up library, which uses the “take-a-book-leave-a-book” model and offers free WiFi and downloads to the public. The pop-up library’s mobile and ephemeral nature seems to be a direct response to an information age that allows us a constant flow of communication outside of our immediate surroundings, and to a hostile economic climate that has left the poor segregated in underserved and barren areas of the world. These libraries reinforce the necessity of open access to information and its agents, while abandoning its traditional structure and taking on the transient quality of information today. The library’s opening of access to the general public seemed benevolent, but the underlying forces were patronizing in nature. Upper-class philanthropists believed in libraries as ways to assimilate the working class to their ideals and thus qualm social unrest (Nauratil, 39). Pop-up, community-based libraries could easily act in a similar manner, disguising assimilation tactics as wholesome public service. A more sinister view could propose that these libraries are infiltrating community spaces to disrupt existing and relevant conversations. However, this idea that the library can act as a vanguard of mainstream ideals can be disturbed upon closer inspection. We must question what these libraries are meant to offer us and how they choose to interact with us. Not every pop up library follows the same model. This year, the Floating Library emerged on the Hudson: a pop-up library aboard the Lilac Museum Steamship organized by artist Beatrice Glow. The space is open to the public. The ship will offer, “a range of reading materials from underrepresented authors, artist books, poetry, manifestoes, as well as book collections, that, at the end of the lifecycle of the project will be donated to local high school students with demonstrated need.” The ship also offers art installations, performances, and workshops dedicated to DIY politics with an emphasis on leftist politics and environmental concerns. Both pop-ups are at least part artistic experiment, but I wonder which library services the community better. Both have an agenda: the Little Free Libraries aim to be accessible to what the public, while The Floating Library aims to expose the public to new ideas, authors, and culture. What is of more value to the public: accessibility or exposure? The Little Free Libraries were set up in deliberately public places, while the Floating Library exists in a contained and maybe exclusionary place. Surely it’s easier to grab a book from your bench-turned-book-shelf than to trek to Pier 25 on the Hudson River. But then again, we must wonder who has the best access to these Little Free Libraries, all located on the Lower East Side? I would also seek to question: where are the librarians, curators, and information specialists? While I am not about to assert that the Little Free Libraries actively aims to uphold bourgeouis ideals and brainwash the working class, the project isn’t interested in engaging the public in conversation surrounding its material. 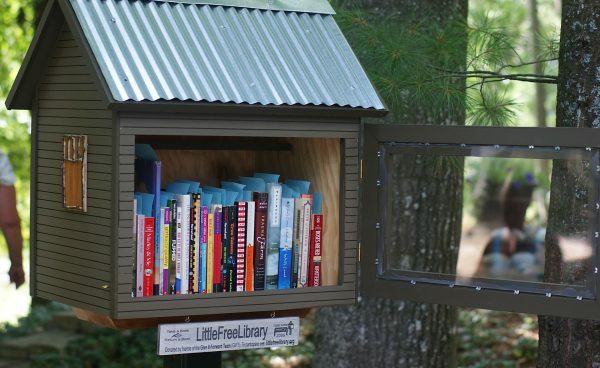 The Little Free Libraries project seems to focus more on the book than on the flow of information between people. In some ways, this echoes the idea of the enchained book in university libraries. Andre Cossette touches on this in Humanism and Libraries, noting, “The tidy arrangement sufficiently shows the importance that [universities] accorded to the preservation of books as opposed to their diffusion and sharing” (41). 6 Leaving books in odd corners of New York City for casual perusal could hardly be called a focus on preservation. However, both models of libraries seem to value the book over its information. That seems to be the case for the director of the PEN World Voices Festival, Jakab Orsos, who told the Times, “It really restores my faith, this connectedness — how people are actually harboring the beauty of reading and the book and the importance of the book.” 7 Part of the appeal of the Little Free Libraries project is the novelty of seeing a book in a bird-feeder instead of on a shelf. Glow’s “Floating Library” seems more focused on conversation surrounding content, than the book itself. To me, this seems to be the more meaningful way to engage communities. Whether it’s the most appealing way is another question. Nearly 30 years in the making, the building of the Central branch of Brooklyn Library that dominates a corner of Grand Army Plaza, went from ground first being broken for the building in 1912, to completed construction in 1941. In 1997 the Landmarks Preservation Commission declared it a landmark building and in 2013 the interior of the library, much like the concept of the Public Library itself, remains a work in progress. Walking into the Central branch is literally like walking into an open book, one that offers glimpses of how the public library of the past and present is actively repositioning itself for a future role as something much more than simply a repository of knowledge and information, accessible to all. On a recent visit, I decided to take myself on a tour of the two floors open to the public before settling into the Youth Wing for an afternoon of observation and a conversation with one of the library’s two children and young adult specialist librarians on duty that day. After the near complete silence in the adult/reference sections and the popular library upstairs, and the low buzz of the info-commons and the library café in the main lobby, the noise level goes up a notch or five as I opened the doors to the Youth Wing which is a world away from traditional notions of the public library as quiet space. And while there is certainly public debate and a lot of enthusiasm for having both types of environments, the palpable energy of the Youth Wing space certainly made for a lively library visit. The first thing I’m told by Yesha, the Y.A. librarian, who is standing under a “Cats Against Cat Calls” banner (a visual medley of pink lettering and photos of cats in their best haughty feline pose) is that she herself was asked to be quiet recently by a young patron for talking too loudly – so much for the mythical figure of the shushing librarian! While the main focus of the Youth Wing is still reading and study, how that reading and studying is undertaken is changing rapidly. Books are still central to the space but laptops are also available for checking out and there are eight desktop computers for use in the Y.A. area. Color printing, either from a library computer or a patron’s own electronic device, is available for a small fee and Yesha handles queries and facilitates various printing requests during the course of our conversation. In addition to the computers in the Youth Wing, teens also have exclusive access to all the computers every Tuesday afternoon between 4.30pm and 6pm in the Info-Commons as part of the Teen Tech Time program. However, by far the most popular teen tech offering is the Active Gaming Arcade program on Saturdays providing access to games such as Minecraft, which hones players creative gaming skills, encourages them to explore new environments, collect resources to use in these spaces and adapt and protect the space from attack. A downside Yesha mentions in terms of having the availability of online games is that the teens rarely play against each other but tend to retreat into the games by themselves and so another aim of teen programming at the library is to try and balance things out and encourage more interaction between patrons. To this end there is an art club, writing clinic, poetry workshop, book club and a Game On! board game challenge, there’s even a monthly open mic. session as part of the teen program. Programs are planned to run with 2-15 teens taking part and having eight or more participants is considered a success. As custodians of information, librarians everywhere have a role to play in eliminating the root causes of poverty, illiteracy, unemployment, and inequality. It is no longer acceptable for libraries and librarians to refuse to acknowledge this social responsibility. The choice is simple: if the information profession does not acknowledge its social responsibility and act upon it, it will no longer have a social role. People will then develop alternative models of information and knowledge communication, which do meet their needs. There will then be no libraries as we know them today. The choice is our to make – today. The location of the Central branch means that it services teen patrons across a broad demographic spectrum, from the relatively high-income area of Park Slope to the lower income areas of Crown Heights and Brownsville, as well as patrons who travel from further away to use the facilities unique to the Central branch. In turn this means there is a real opportunity to level the playing field of access, and in terms of teen patrons, by far one of the most effective and popular programs is T4 – today’s teens, tomorrow’s techies. Previously, I’d spoken to a former participant of the program, now a librarian himself who explained that for him the program had given him an opportunity to take a different path to the one he’d been heading down as young man. While currently only offered at the Central branch of the Brooklyn Public Library, the program gives teens a chance to learn basic computer skills via an intensive summer workshop. This is then followed up with a minimum commitment of three hours per week for at least a 6-month period of volunteer work at the library, assisting librarians, and trouble shooting computer problems encountered by older patrons. This intergenerational aspect and the social skills that are developed while carrying out a responsible volunteer role, as well as the varied practical skills that are learned, demonstrates the active way the library is fostering not just a community for its own future but make tangible what Dewey thought a “Great Community” might be. Block quote: The Professional is Political: Redefining the Social Role of Public Libraries, Shiraz Durrani and Elizabeth Smallwood – first appeared in Progressive Librarians, No. 27, Summer 2006. Republished in Questioning Library Neutrality, Alison Lewis Ed. Library Juice Press 2008. The Coldest Girl in Cold Town is the latest Y.A. novel by Holly Black, published last month by Little Brown (part of the Hachette Book Group). It falls easily into that most ubiquitous of Y.A. fiction categories: dystopian, vampire romance. A week after publication, I purchased the Kindle edition for $4.99 (I had my reasons). While the New York Public Library purchased two eBook editions, for which there are currently multiple holds on the library website, and 72 hardcover copies (of which 22 are currently available to borrowers). Why so many hardcopies and only two of the eBooks edition? It couldn’t possibly be due to the sky-high price extracted from NYPL by the publisher to acquire an all too temporary license to the eBook edition? Noting that the mark-up to libraries in some instance can be as much as 300%, Brodsky post examines the variety of other restrictions that come with eBooks, not just in terms of what device an eBook may be read on – which he claims is discriminatory enough in itself – he also tells of how libraries are only allowed to circulate an eBook a certain number of times before a decision must be made to renew the library’s eBook license. Not exactly a vision of a library utopia with equal access to all! But then should we be surprised? as Peter MacDonald has previously asserted (Corporate Inroads and Librarianship: The Fight for the Soul of the Profession in the New Millennium, essay from Questioning Library Neutrality, ed Alison Lewis 2008. Original essay published in Progressive Librarian, Nos. 12/14. Spring/Summer 1997). And clearly we need that eBook buffet. So where does this leave the public library? Perhaps, like the heroine of many a romance novel, in need of a complete make-over. (Maria J Nauratil in The Alienated Librarian pg 77, quoting Daniel Carroll’s Library Marketing: Old and New Truths Wilson Library Bulletin 57, November 1982 pg 216). But it must be incredibly demoralizing to be trying to get the message out that public libraries are there to cater to patrons, who are often the most under served in the community, while at the same time coping with underfunding, as well as pressure to maintain their collections in the face of strident commercial competition. So what about a happy/happier ending? While it might not make everyone happy all of the time, there is much worth considering in Eric Hellman’s August, 2013 blog post about an alternative business model for Libraries and eBooks: A Rational Framework for Library eBook Licensing. Hellman offers up a range of practical suggestions for Libraries and publishers to cooperate over eBook licensing, including the currently contentious notion that if the library buys an eBook, it should get to keep the eBook. However, he is also advocating compromise when he suggests libraries could pay up to a 500% mark-up for the most popular eBooks but a much reduced price for eBooks where the library will most likely have some hand in making them a success. While Hellman acknowledges his proposals would require a radical rethinking of how things are done, never an easy ask, the benefits to both publishers and libraries would be immense.